My mother and mother in-law are worlds apart – one enjoys eating rich, calorie-laden food and the other bans them. While I enjoy and appreciate my mother’s attempt to keep me healthy and skinny, I also like to sin live a little and indulge in ‘bad’ food such as fried chicken. When my mum in-law read about my fried chicken article in the papers, she insisted that I try this very good fried chicken ‘somewhere in Setapak’. 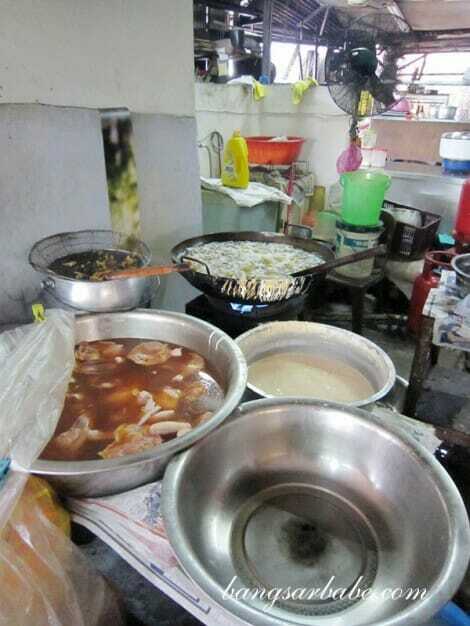 Turns out, the fried chicken place in mention is in Jalan Gombak (near SMK Chong Hwa Setapak). 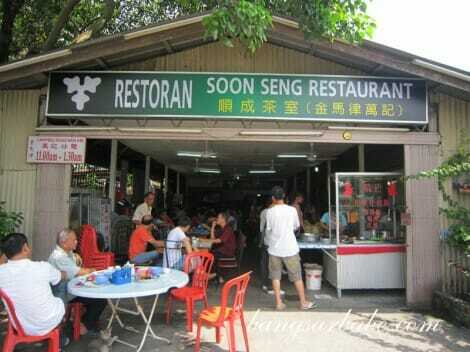 The signboard says Restoran Soon Seng, but there’s also another signboard inside that says Cambell Road Ban Kee. I reckon the latter is open at night for tai chow. 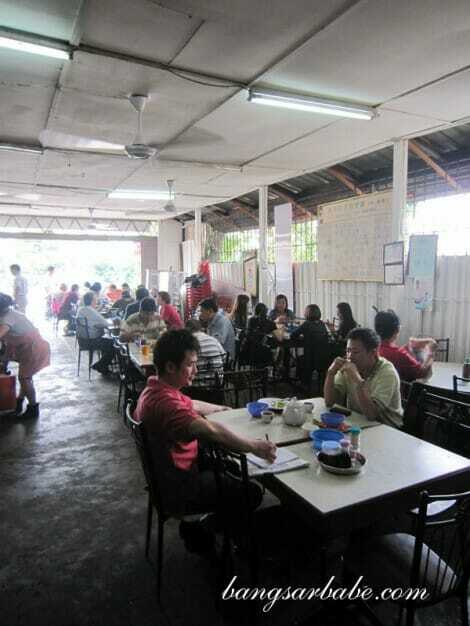 The place was crowded during lunch hour and finding a table was difficult. Note that during lunch, this stall only serves fried chicken rice with an option of steamed chicken, char siew or siew yuk. We ordered two pieces of fried chicken leg (RM7.50 each) and a small portion of char siew and siew yuk (RM7) to go with our rice. She was right; it was good fried chicken. I wouldn’t say it was more delicious compared to the Klang Fried Chicken – the marinade and batter are different. The batter was crunchy yet light, and the chicken leg was smooth and firm. Very moreish and incredibly bad for the heart. And waistline. The char siew and siew yuk was below average. I found the former very lean and dry, and the siew yuk skin was more hard than crispy with a layer of hard fat. Don’t bother ordering these. The chilli sauce was aromatic from the garlic bits and packed quite a punch. Drizzle black soy sauce on the rice and dig in! It gets quite hot in the afternoon, so if you’re planning to eat here in office clothes, loosen that tie and roll up your sleeves! Verdict: Come here for the fried chicken but skip the char siew and siew yuk. Love the way you drizzled black sauce on the rice which was cooked in chicken stock … Mmmmmh, I want breakfast!! Next round when you’re in KL! Hey Sue Lynn, it’s alright to indulge in what your Mom calls the sin food as long as you’re living a healthy lifestyle. The usual chicken rice that I have is steamed and not fried, so I guess I can give this a shot one day. By any chance, is it near the Ampang Yong Tau Foo? I really can’t resist fried chicken! Me neither. But it’s so evil! The fried chicken batter looks golden and crispy and the insides tender and juicy – they seem to have gotten the combo just right. i am nearly 1000 km away, i also drool at these pics! aiyo! i just had my lunch but i am hungry again just visual feasting on your blog. i haven’t recovered much, but when i do, i shall hit kl and we paint the city red, babe! Yeah…totally drool-worthy. KFC cannot even compare to this! 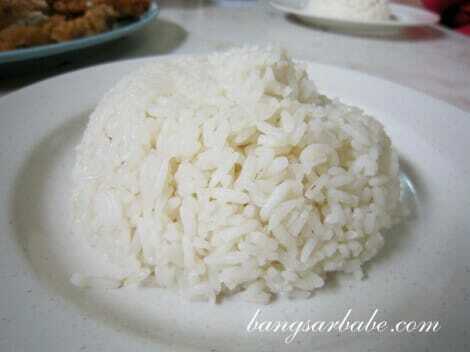 If you love chicken rice, you’ll love this! 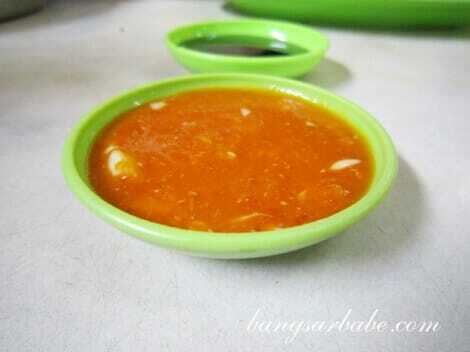 Have u tried Lim Friend Chicken in Subang Jaya SS14, Wong Soon Kee restaurant? Taste much much better than KFC. sorry earlier post got typo error. 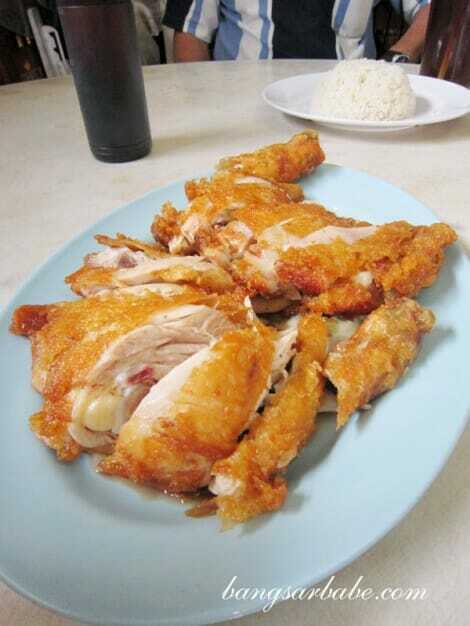 Have u tried Lim Fried Chicken in Subang Jaya SS14, Wong Soon Kee restaurant? Taste much much better than KFC. Not yet. I heard got damn long queue right?